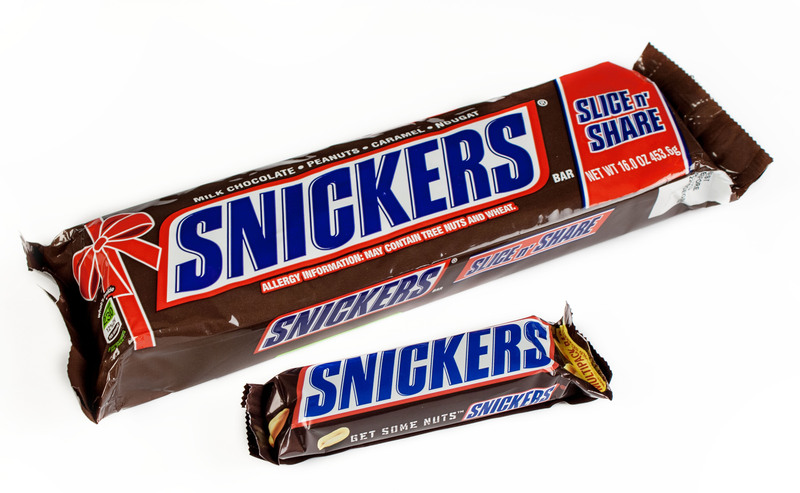 A normal Snickers bar costs 60p, weighs 58 grams and contains 250 calories. The new novelty bar is 10 inches long, weighs a hefty 454 grams and contains a whopping 198 grams of fat and 2,000 calories. The World's Largest Snickers Bar is being sold by UK online retailer Firebox.com for £24.99 in time for Christmas. The chocolate bar that just keeps on giving should be eaten in nine servings. The website says: 'Grab yourself a meat fork and an electric carving knife, slice it up, and enjoy a large mouthful of nutty, chewy, chocolate heaven. "It's all you need to become horrifically obese." So imagine what an incredible person you'll become once you've feasted on this colossal piece of confectionery."